1955: Marilyn worked with WAIF, an organization that placed abandoned children in homes. Jane Russell enlisted Marilyn’s help. 1955: Marilyn’s appearance at a circus sponsored by Mike Todd at Madison Square Garden in New York City benefited the Arthritis and Rheumatism Foundation. She appeared astride a pink elephant. 1957: Marilyn gave earnings from the world premiere of The Prince and The Showgirl to The Milk Fund for Babies. 1962: Marilyn’s final public appearance was at a muscular dystrophy benefit held at Chavez Ravin Dodger Stadium in Los Angels on June 1, her 36th and final birthday. Marilyn’s final charitable donation was her largest: In her will, she left 25% of her estate to former psychiatrist, Dr. Marianne Kris, “to be used for the furtherance of the work of such psychiatric institutions or groups as she shall elect.” Knowing Marilyn’s enormous love for children, Kris chose the Anna Freud Children’s Clinic of London. Fact or Fiction? 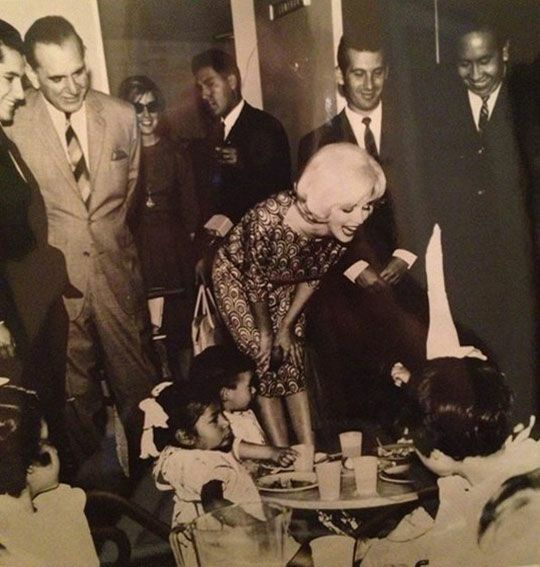 In 1962, Marilyn visited an orphanage during her trip to Mexico. Her initial donation was $1,000.00. She ripped up the check and replaced it with another for a $10,000.00 donation. That night was one of the few nights in her later life that she recalled sleeping without the aid of sleeping pills. It’s Fiction: While it’s true that Marilyn visited an orphanage during her 1962 Mexico trip, there is no evidence in Marilyn’s 1962 financial documentation (now part of this collection – view here) of having made either donation.